If you're looking for a veggie noodle recipe this baked spaghetti squash spaghetti couldn't be easier. 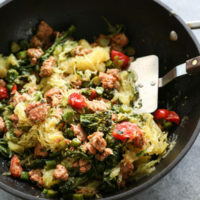 It's topped with an herby Italian salsa verde, which perfectly compliments the smokey sausage and bitter broccoli rabe. You can use broccoli if you can't find rabe, or ever regular broccoli cut into tiny florets. Using the largest chef’s knife you have, cut the spaghetti squash in half lengthwise. It’s helpful to put a crumpled dish towel on your cutting board to stabilize it, or to remove a little bit from both ends so you can stand the squash upright without it wobbling. Scoop out the seeds and stringy bits from the center cavity. Arrange both cleaned squash halves cut-side down on a parchment lined baking sheet. Add 1/2 cup water to the pan (this will help steam and soften the squash). Bake in the oven until the squash is tender, meaning a fork can easily be inserted from flesh to skin, about 45 minutes. Flip the halves over to allow them to cool. When safe to touch, use a fork to shred the spaghetti strands from the squash: begin along the edges, pulling the strands towards the center, then scoop the bundle into a bowl. While the squash is roasting, cook the sausage: in a large wok or skillet, heat 1 tablespoon of olive oil over high heat. Add the sausage and brown, breaking it apart with your spatula into bite sized pieces, until golden brown and cooked through. Fold in the broccoli and season lightly with sea salt. Sauté for 5 minutes more, or until the broccoli is tender but still al dente. Add the tomatoes and cook for 2 minutes more, until slightly soft. Remove from the heat. Make the sauce: In a blender or food processor combine the parsley, basil, capers, vinegar, lemon zest and juice, olive oil, salt and a dash of red pepper flakes. Puree until coarsely combined (a little chunky is ok!). Add more olive oil if necessary to loosen the mixture. Assemble the dish: Add the squash to the pan with the sausage mixture and season generously with salt. Drizzle with half of the sauce and toss to combine. Taste for seasoning and add more salt or red pepper flakes as necessary. Serve immediately alongside the remaining sauce. If cherry tomatoes aren’t in season, sub 1/3 cup finely chopped sundried tomatoes.